As of 2012 there were over 180 non-native species reported to have reproducing populations within the Great Lakes Basin (www.GLANSIS). For the majority of these species, humans are the major cause for spread. Many of the newest arrivals have only been observed in a few locations and may be able to be contained. Some cannot survive our harsh winters, although with milder winters predicted due to climate change this will likely change. Some species are much more invasive than others, causing significant impacts on our native flora and fauna and ecosystems. These species are the ones that we need to be most vigilant about curtailing spread and, if feasible, implementing control strategies. 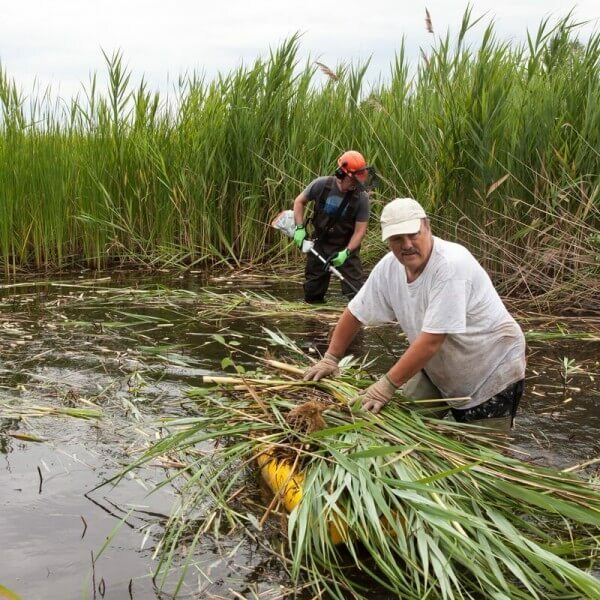 In 2005, Agriculture and Agri-Food Canada recognized Phragmites as Canada’s worst invasive plant. This aggressive grass out-competes all native plants and significantly reduces the habitat value for wildlife, including species at risk. This plant also poses a significant fire hazard during the dormant season and negatively impacts recreational activities, lake views, and property values. 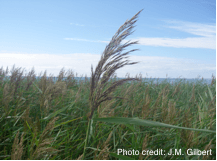 The quicker Phragmites can be dealt with, the lower the cost and effort required. Ignoring this plant is not an option. 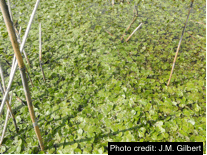 This small, free floating plant can form dense, thick mats clogging open water areas impeding movement of fish and other aquatic animals as well as water craft. The spread from infested sites to new water bodies is mainly due to plant fragments being transported on boats, trailers and other equipment. This pretty plant may look harmless but it can develop into dense stands and spread between water bodies through viable plant parts. When not in flower it is very difficult to distinguish invasive iris from our native Northern Blue Flag (Iris versicolor). 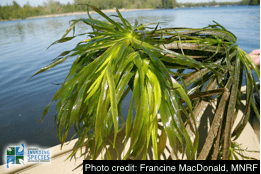 Do not plant this ornamental species in your ponds or other backyard water bodies. 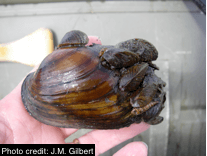 Zebra mussels have decimated many of our native freshwater mussel populations throughout the Great Lakes. The invasive mussels colonize and encase native mussels impeding their ability to filter feed and reproduce. Coastal wetlands provide an important refuge for a number of native mussel species since zebra mussels does not tend to populate these systems in any great number. One more important reason to protect the remaining Georgian Bay wetlands. This very pretty ornamental grass is becoming more common along our major roadways including Highways 400 and 11. This grass can spread very rapidly and thrive in a variety of habitats. 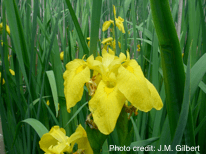 It has the potential to become just as problematic as Phragmites. Do not transport or plant this ornamental grass or any other non-native plant at the cottage or in areas where it can spread into natural areas. Invasive species is second on the UN biodiversity threat list that also includes habitat loss, population, pollution, over-consumption and climate change and desertification.